"Only stayed for a few nights but really liked this apartment. Underground car park was great, although make sure you get the fob with you keys! Lift takes you to top floor where you find apartment. Warm nicely decorated apartment with great functionality. Particularly liked having an oven which is rare in the alps Only minus was there was no bath to sooth the old legs after a days skiing but shower was hot and powerful. Good location for town centre, literally 5 min walk (if that) and ski lifts 10 drive but well signed. We have booked again for 2015 and can't wait!!" "We stayed in the apartment for a week in March 2014. The apartment is on the 4th floor but the lift takes you right outside the front door so there will be no issues if you don't fancy taking the stairs. The apartment itself is fantastic and we found ourselves staying in a lot more than we would normally as it was so nice. There were 4 of us staying in the apartment which was a really nice, if you were taking the full capacity of 6 obviously it wouldn't be as comfortable. The beds were comfortable enough and we had them set up as 2 x twin rooms, with one of the rooms being a little on the small side if set up this way, as it would normally be a double. There is plenty of storage for your clothes and ski gear and there is also a ski locker for drying for clothes with individual boot warmers which was really useful. The shower was nice and powerful and had what seemed like a limitless amount of hot water. All the furniture in the apartment is quality, solid wood and a large leather sofa for relaxing in front of the flat screen TV and Sound bar which you can play your iPod ect through. The kitchen was well equipped with almost everything you can think of for staying self catered. The view of the mountains from the apartment and balcony is unbelievable. The location of the apartment is also pretty good, about 5 mins walk to all the shops and the bus stop which takes you to all the ski resorts. Overall I would highly recommend the apartment. The company who manage the apartment (snostation) were really helpful before and throughout our stay and allowed us to keep our bags in their office on the last day." "Le Refuge, is a beautifully finished good size apartment in the centre of Chamoinix. 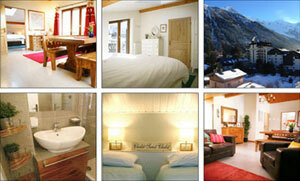 Set on the top floor it's sloping ceiling and wooden beams gives it that wonderful chalet feeling. We based ourselves there for a weeks holiday with our 7 month old little baby boy, the open plan layout was brilliant as we could always keep an eye on him, the kitchen was kitted out with everything we needed and the travel cot fitted comfortably. A lot of fun was had by all both on the slopes and relaxing in the evening." "We were lucky enough to spend New Year at Le Refuge and be one of the first guests in the newly refurbished apartment. The owners have done a fab job. Everything you could want from ski accommodation - comfy beds, hot and powerful shower, stacks of space to store wet gear and a great, sociable dining area to while away the evenings. There were six of us which worked perfectly. Right in the centre of Chamonix so a quick walk to all shops, bars and restaurants (recommend Evolution for partying and MBC for amazing burgers) and a parking place inside if you have a car to drive to the slopes. 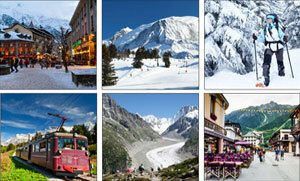 "Le Refuge is a hidden gem right in the heart of pretty Chamonix. The apartment is beautifully decorated; cosy Alpine charm abounds and complements the stunning views from the balcony windows. It’s the perfect place to retreat after a hard day on the mountain. The owners have thought of everything: strong powerful shower, ski-boot dryers cupboards, comfy beds, a well equipped kitchen and a large living diner area, perfect for big sociable meals. We couldn’t have asked for a better place to see in the New Year with friends. Highly recommended. We’ll be back!" "We had a wonderful stay in Le Refuge and had everything we needed for the perfect 'white Christmas', (although we would have liked a little more snow!) The apartment warm and comfortable and had everything we needed - including boot warmers (much to the delight of my youngest), a well stocked kitchen and spacious dining table - which allowed us to cater for friends on Boxing Day. The 'games cupboard' provided much entertainment, and the sofa area was perfect for film watching. We all slept well, including my son on the sofa-bed, and my husband particularly enjoyed the height of the shower, being over 6 foot. A great place to stay, which we are sure to visit again soon."